On September 21 I began running back and forth to work as part of my daily commute. Being honest with myself, and having accumulated a lifetime of failed endeavors, I began this experiment with an open mind. I know from too much personal experience that no matter how good an idea seems at the start, I might abandon it at any time. Although many consider it a myth, I told myself if I at least tried to do this for 21 days then it might become a habit. Now that over six weeks have passed, here is a review. Without trying to sound overly evangelical, I am, well, ecstatic. The experiment has been a massive success, I have gained insights, on both my running and life in general, that I could not have imagined in advance, and the icing on the cake is I have experienced a bit of a miracle, or at least a piece of magic. First, the miracle. My traditional commute consisted of walking or driving to the Patco station (.65 miles), taking the train to 12th/13th and Locust, and then walking to Community College of Philadelphia at 17th and Spring Garden (a little over 1 mile). The one-way commute took me about an hour on average, and included a 20-minute brisk walk. My new commute consists of running from my house to the station, then getting off at various stops, and running various distances to work. Sometimes I take the train to the last stop at 16th and Locust, and run out to the Schuylkill Banks Trail, then up around the Art Museum before heading back to 17th and Spring Garden. Other times I get off in Camden and run over the Ben Franklin Bridge. I have also run all the way from work to home a couple of times (8.5 miles). To explain the miracle, or magic trick, most easily, I will break down a 40-mile week. First, I have to mention, 40 miles may not be worth much bragging, but for a sprinter who has not logged significant road miles since giving up triathlons about four years ago, it is a really big deal. To complete a 40-mile week, I run from home to the station (again, .65 miles) and then run from Camden City Hall to CCP (3.5 miles). A few hours later I run back on the same route. It takes me about 50 minutes to go one way, including waiting for and riding the train — total travel time from point A to B. Traditional commute: 1 hour. Running commute: 50 minutes. This means I am logging over 40 miles and not using any free time to do it. Technically, I am actually saving about 50 minutes of free time by running. For a married guy with a 3-year-old son and a 5-month-old daughter, this is truly groundbreaking. My running career is significantly enhanced by having a wife that also runs, and together we work very hard to help each other get our workouts in, but it is still a challenge to find the time. Instead of trying to “find the time” I have managed to simply convert time, from just commuting, to commuting and logging serious miles. Now I ask, how many people say they would exercise more if they could just find the time? So that is my run to work miracle, and I truly feel like I am somehow cheating the universe. As I run across the Ben Franklin Bridge on particularly windy days I hope the universe doesn’t try to get me back by sending me over the railing! Now I will explain some of the insights. I told myself at the outset of this experiment to run easy. Back in the summer I decided to follow the advice I give many of my high school track athletes and joined the GPTC cross country team. I previously had decided to make an honest effort at the 800 meters this year, and everything I have read implies that I need to start logging some mileage off the track. Even though I tend to agree with the philosophies that promote training at a fast pace, with my limited distance experience I decided it might be healthier to just do the miles. I am also a huge proponent avoiding injury, and Gradual Progress (see I Ching, the Chinese book of change) is an ingrained part of my running practice, so taking it easy, at least at first, seemed to make sense. The biggest insight to come from running with this kind of mindset is that I enjoy road running more than I ever have at any time in my life, AND I am increasing my endurance and speed more rapidly than when I have made either one my focus of running. Oh, that sounds so quaint and hippy-like you might say, but I have also dropped my 5k pr by over one minute since beginning the experiment, and I am expecting to break 20 minutes for the first time in my life later this month. Another insight is that I am more relaxed and focused at work than I have ever been, and I am enjoying my time on the train more than ever. I arrive at work with about 20 or 30 minutes to shower, change, and get a cup of coffee before my first class. I exchange my super minimal running shoes for a pair of super minimal dress shoes, and I float across campus in the state of mind that I used to only feel in my own living room after a good run. I have a lot of students that can really push my patience in various ways, and somehow they just don’t bother me all that much any more, at least not early in my work day. I used to get on the train in the afternoon to come home and collapse into a seat, too tired to do anything useful. I would often play solitaire on my phone, and by the time I arrived at my station had sunken into an afternoon semi coma. For some reason, the brisk walk to the station did not counteract this tendency. As much as I enjoy walking, it never leaves me very revived. Now, when I get the station after a run, I open up my iPad and return to whatever book I am reading. Since September 21st when this experiment started, I have finished Born to Run (only took two years), and read Scott Jurek’s Eat and Run (awesome by the way), Stephen Hawking’s A Brief History of the Universe, and Alberto Salazar’s autobiography, Fourteen Minutes. I consider myself as much of a reader as I do a distance runner — always have the best intentions and wishes, rarely follow through. I never make New Year’s resolutions, but last year I said I wanted to read one book a month for all of 2012. By September I had read a few more pages of Born to Run (began in 2011) and a few chapters of Bob Dylan’s Chronicles, Volume I. Pathetic. But now I understand that when my brain felt like mush a lot of the time, reading was the last thing I wanted to do. Running back and forth to work has somehow made my brain less mushy. If you would like to learn more about running to work, check out some of my earlier posts. There are a few logistical considerations, but also with a little creativity I think a lot of people could give it a shot. Having a locker room and showers at your place of employment is amazing, but if you live in the city, there might be a reasonably priced gym within walking distance of your work. I also recommend a running-specific back pack. “If you give a mouse a cookie, he will ask you for a glass of milk.” And so begins the children’s book by Laura Numeroff. Like all children’s books, this one is more about human nature, as a lesson for kids, than it is about mice or cookies. Today I was running down Fairmount Avenue shortly after leaving work, thinking about the food I eat, and a conversation I had with one of my former high school runners-turned track club teammates, John Vu. John graduated from Cherry Hill West, where I am an assistant track coach, last spring. He is now running cross country (for the first time) at Camden County College, and is also a member of Greater Philadelphia Track Club with me. He asked if we could meet last night for a run, and I convinced him to do a track workout. It turned out that was exactly what he needed, as he has been feeling burned out from the heavy, high-intensity mileage he has been doing, and wanted some guidance from me. We talked about a lot of things while we ran 8×400 @ 1:30 with 2-3 minute 400m jog rests. We talked about what it does to you when you train full tilt every day without breaks, we talked about getting enough sleep, etc. But at some point, we ended up on the subject of food. I think he said something about how he eats a lot of fast food, but that doesn’t matter since he is running so much. I almost stopped running in the middle of the rep we were on. He said his coach has told him not to worry about what he eats, since he doesn’t have to worry about gaining weight. She has also told him to eat about 4000 calories a day. I would guess 4000 calories is about right, but it horrified me to think of eating 4000 empty, fast food calories. I tried to explain that how we fuel our bodies is an essential part of our success, and that if he is feeling burned out he needs to first make sure he is getting eight hours of sleep each night, and second make sure he is eating nutritious high calorie foods. As I ran through this conversation in my mind today, I thought about how I have actually gotten to a point where just about everything that passes my lips is highly nutritious. I still drink too much diet soda, and I am still working on getting the right ratios of nutrients into my system, but in general, my diet has improved immensely over the last few years. Why? Simply by becoming a runner I think I began to make a lot of changes. Actually, it was when I was doing some heavy triathlon training that I established a common routine of cooking lean meats, whole grains, like rice and quinoa, and nutrient rich vegetables like collards, kale, spinach and broccoli rabe. But for a while I still ate crappy food out quite a bit, like cheesesteaks and pizza. Okay, I still eat a fair amount of pizza, but that is probably the worst thing I eat, and my portions have shrunk from absurd to maybe just a little more than normal. If I could get John, the 18-year-old college runner to get eight hours of sleep and eat a diet like that I think he would be unstoppable. His coach recognizes his talent. As a first-year distance runner (ran 400m and under until half way though spring track of his senior year) he is running 8Ks at just over 30 minutes. Before he graduated he decided to “try” the 800 meters and ran 2:08 in his third or fourth race. This is on a typical teen-ager’s sleep regimen and fast-food diet! I referred to the mouse and cookie, because I believe that like a lot of things, a simple turn of one’s attention, or a refocus can lead to eventual great change, but it usually happens slowly. I never decided to eat healthy. Actually, I tried that over the years and failed. Instead, what actually worked was simply turning my attention to a better way. If you give a mouse a cookie, he will ask you for a glass of milk. If you eat a healthy meal, you will want another. This is the perfect time of year to be a runner. Today was sort of like the first day of the fall that you make sure the window is closed when you take a shower, or when you use hot water again to shave — today I deliberately crossed several streets just to have the sun shining directly on me. You know you are a runner, as opposed to someone trying to establish a new good habit, when you catch yourself doing something like this, and immediate comparisons to what its like to run in mid-summer, avoiding sun at all costs, or spring, when those first warm rays brighten a run. Today was a big step. It was the first time in I can’t remember that I ran back-to-back days. Yesterday I ran a total of 8 miles, broken up as a run to and from work, and today I did an easy relaxed 3 on my way to work. This was an exercise in trust. I am trying to trust a theory that it is fine to run every day, in the same way it is fine to walk every day. Written like that, it seems absurd to question it. If we think nothing of walking every day, why would we question running every day? I am talking about running at a moderate pace, less as any sort of attempt to increase fitness and more as simply a means of transportation. If I can walk a mile easily from the train to work, why can’t I run it? Today was my first step toward that attitude, and it felt great! I allowed myself to warm up on the run, taking easy, small strides at a high cadence, and within a few minutes the normal stiffness that results from 8 hours of sleep faded away and in its place emerged a comfortable, smooth 9:00 pace. I felt like some new sensation kicked in today — a softness about the run, and a clarity. Maybe it was the soulful, rainy weather. Last week I realized how running to and from work is influencing my perception. The week before I noticed this too, but last week I noticed it on finer, deeper levels. Today I noticed it on levels finer yet. Scott Yurek wrote about experimenting with only eating raw foods. He eventually gave it up because, literally “The time involved in chewing as too much (Eat and Run, 125),” but he developed plenty of new insight to make the experiment worth his while. One example he gives is that he began to taste more flavor in food, and could even tell when a carrot had been picked by how it tasted. Any time we change our routine it has an effect on our perception, and if we change our routine in a way that is more beneficial to us in some way, the insights become exponentially more profound. It’s like the universe’s way of rewarding our effort to improve, or maybe just to survive better. Everything about getting to and from work, running, how we move our bodies and why, will be altered by something as simple as running to work. When I first began teaching at Community College of Philadelphia I converted an old ten-speed bike into a flip-flop fixie (a fixed gear cog on one side of the rear hub and a free spinning cog on the other). Riding a bike to work was cool, and it provided plenty of new insights, but sadly, a lot of those insights were quite negative. I gave up the bike after one semester, feeling rather certain I would get hurt or killed, by either a careless motorist, or one who had a vendetta against all cyclists. I do not care to pollute this blog with a description of the rage I witnessed from a bike saddle, but it was enough to hang to hang a totally awesome fixie in the basement where it has been ever since. So when I gave up the bike I began walking back and forth from the train station. Immediately the new activity provided a new perspective on the city, other commuters, cars, homeless people, etc, etc. Instead of moving rapidly across Center City on my bike, I was moseying along some of the most intersting intersections, parks and squares in the city. I actually very quickly began getting off the train a stop early so I could walk up Broad Street, around City Hall, and through Love Park, adding five minutes to a one-way trip. I walked back and forth to work until I began running a few weeks ago, and during that first week of runs I realized I was dying for a new perspective on my commute. Now I am seeing new parts of the city that are far off the old walking route, and experiencing everything about my daily commute in new ways. Perhaps the most startling discovery is that running actually seems more contemplative than walking. I think this is due to the route, and how crowded it was. I actually grew increasingly frustrated by walking in Center City, as I am simply flabbergasted by how rude, even mean some drivers can be, and how ignorant of road rules others can be. There are a startling number of drivers in the city who do not know, or care, for example, that pedastrians crossing the street on a green light, in a crosswalk, have the right of way. Once I run beyond the crowded Center City sidewalks, I am in open space, crusing along the riverside, or through the Azalea Garden by Boat House Row. I also think running induces a better mind-state for contemplation than walking, but that may be a personal preference. If I run every day, just like I walk every day, then my leg muscles stretch on a regular basis, and I feel the nagging aches and pains dissolve away. I can feel my Achilles tendons releasing, and I notice the difference walking down the stairs in the morning. Running daily, moderately, just keeps everything working properly, and does not have to induce stress, fatigue or recovery on the body. I wonder if I should be approaching my sprint training more like this — some base level of daily running, with fewer workouts designed to increase fitness, strength, speed, etc (cause adaptations). Less stress, more targeted stress. More efficient applications of stress on a more fit body. Maybe I am already doing too much, or just more than necessary. The run from work to the train, straight down 16th (1+ mile) was eye-opening. It was a pleasant, relaxing stretch. And extended pose. Clearly healthy, even beneficial, but absurdly short. Perfect. I need to recognize the perfection in all distances, especially short. Make the 1+ mile run to the train a perfect event. A perfect rep. This morning I decided to pause to run up the Art Museum steps for a photo, given the weather seemed perfect for a somber, dreary image. “We used to own this place,” I said to Maggie, after we completed an 8-mile run along the Schuylkill River, and took a breather by Lloyd Hall before packing up the kids and heading home. It was strange, and really fun, to run there again. It had been our backyard, literally, for about three years, before we moved to Jersey. We had an apartment at 29th and Poplar, about a ten minute walk to where were standing, and it is hard to even imagine how many miles we logged there. It was also really great to NOT be running to or from work. Just as I feel like running to work gave me a different, refreshing perspective on running, after doing for a few weeks I now can enjoy a new perspective on doing a Saturday morning run with Maggie and the kids. I will never cease to amazed how perception works. After my 8.5 mile fiasco on Wednesday, I felt like I needed to get another 8-miler in this weekend, and the weather could not have been more amenable. We loaded up the kids in the double BOB, and headed north along the Kelly Drive trail, knowing it would be a mob scene. Maggie was a little worried about how frustrating it might be to have to stop and start and dodge the combination of bike, pedestrian and runner traffic, but that was exactly the kind of run I wanted — disrupted, slow, flexible. It really wasn’t all that bad, but then we hit the Dragon Boat Race and throngs of people all over the trail. Luckily Kelly Drive was closed and we could run in the street. We averaged 9:00/mile for 2 1/2 miles and then Maggie stopped to feed Sarah. James and I continued on, and I logged 3 1/2 miles at 8:00/mile. By the time we got back to Maggie and Sarah, they were ready to roll, and we finished with another 2 1/2 at 9:00. This ended up feeling like the perfect run for where I am at right now. It’s so cool when that happens. With this in mind, I will start adding some entries here about training, specifically for a run-to-work approach. I think the average person who becomes inspired to try running to work might need to really think about a smart training program, with a clear priority of injury prevention and efficiency (really the same thing). My first big recommendation is to find a walking route to start taking on a daily basis of about a mile. It could be the route from the new gym where you will shower and change before work. It might mean getting off the bus earlier or later than usual. However you make it work, just start walking to and from work every day. From there, you can begin to develop a running route. If it takes 20 minutes to walk the mile or so that you determine, then begin to run a slightly longer route, that also takes about 20 minutes. The idea is that you will run at a pace only slightly faster than your brisk walking speed. If you do this for a while, just enjoying the activity, you will begin to gradually speed up your pace without even trying, and then you will likely want to increase the distance. I knew it was unseasonably warm, but I forgot how challenging it can be to run in high humidity after acclimatizing to cooler fall temperatures. Normally we experience the humidity of spring and summer coming on gradually, and by the time it really hits in June or July we have adapted. But when it suddenly gets humid in the fall, after some seasonable weather, its like going to sleep in March and waking up in August. Today just happened to be the day I got it into my head to run the full distance from work to home. I was excited to make the trip, which is probably what kept me from really thinking about the weather. I felt fine during the first couple of miles, but as I headed up the steady incline of the Ben Franklin Bridge, I could tell I was still recovering from Sunday’s race. By the time I got to the apex, I could tell the heat would be an issue — nothing to awful, but something to be aware of. It wasn’t until a day later that I thought about the 2006 Chicago Marathon. That was the year a heat wave hit the Midwest in October and the marathon ended up being shut down in the middle of the race. Maggie and I were running that day. She was trying to qualify for Boston, and as a result of the breakneck speed she went out in, ended up dropping out of the race. I had finished an iron-distance triathlon the week before, and although I felt more than capable of running 26 miles, I went out at a much more casual pace. The race was total chaos. Because people were downing way more fluids at the water stops than normal, most of them had run out before I, and several thousand behind me, arrived. Not only was this a dangerously hot day, but the vast majority of runners were getting little to know fluids during the race! The race was technically canceled, but that meant little to people like me who had no idea where they were, and really had no choice but to get to the finish line to meet family. I will never forget running through police barricades with police helicopters hovering overhead with bullhorns blasting, “The race has been canceled. Leave the course now. The race has been canceled.” Uh, okay. Anyway, it wasn’t that hot on Wednesday, but given the fact I am not in iron-distance shape, the effect wasn’t all that different. At mile 5 I was hurting. I ended up walking for about ten minutes, then ran another mile, walked some more, etc. until I got home. 8 1/2 miles never seemed so long! At least not for a long time. That reminds me of the first time I logged an 8-mile run. 8 1/4 to be exact — the Schuylkill River loop. 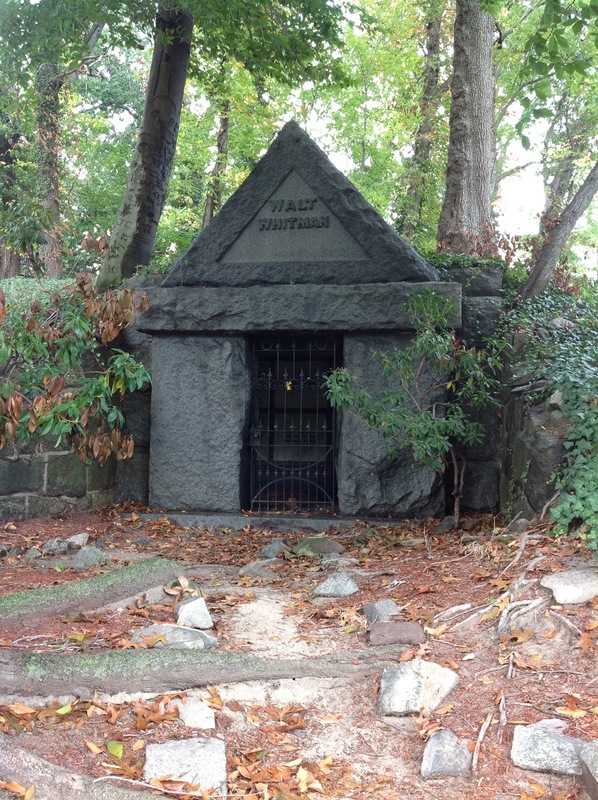 At the 5-mile point on my run home is the cemetery where Walt Whitman is buried. Since I felt so crappy, I decided it was the perfect place to take a breather. I walked down to his grave to snap a photo. Not only was it a Monday, but it was also the predictable day when the stoke of a new endeavor first begins to fade, and hints of the reality creep into the picture. I new this moment arrived the moment the alarm clock sounded at 6:00 am. But I was prepared, because I have experienced this phenomenon many times throughout my life. When I was younger, it would be the point where I quit the new activity, or at least let myself become disillusioned with it. Disillusioned. The illusion is that you are really enjoying something, which implies reality is that you really are not. That is not quite the truth, but then again, this experiment is partly rooted in the idea that running might be something I haven’t experienced it to be yet, might be better, might be more enjoyable. I am sure my first act of the morning was informed by my life experience, but I can’t say it was a conscious decision. I simply walked from bed to my dresser where I put on my running clothes. It was that simple. It wasn’t until I found myself in the kitchen a few minutes later that I realized 90% of the battle is simply putting on the clothes. sometimes I try to make better decisions, but perhaps a better route is to avoid decision-making, in the “let’s think about this” sense, altogether. It was also the day after a 5K race, and I could tell I was recovering. However, I did not feel at all sore. That detail is an exclamation point on what I experienced over the last three days. On Friday, Maggie asked how I thought I would do in the race on Sunday. I hemmed and hawed, not really sure what I was capable of. I had been putting in more mileage lately, at least road mileage, but I definitely had not done any special prep for the race. Then I paused, and said, “I’m definitely going to pr, but I’m not sure by how much.” This was one of the more audacious things I think I have ever caught myself saying to someone. Granted, I am a rather slow middle distance runner. Hell, I’m slow at anything over 400 meters. But I have run a few 5Ks and so the time between pr’s can be lengthy. I last pr’d about a year ago at a local Turkey Trot: 21:22. Not awful, but not much to brag about either. As a result of my last few weeks of running before and after work, that number suddenly took on a completely different hue, and I knew I was faster, even though I could not explain why, or how I knew this. Fast forward to Sunday morning, and sure enough, I pr’d. The surprise was that I subtracted over a minute. New pr: 20:17. And as I wrote earlier, the exclamation point is that I wasn’t sore the next day. Two things worth adding here. First, I have been struggling with plantar fasciitis for a couple of years now, and since I started running to work, and switched to super minimal shoes, the pain in my heel is almost completely gone, and I rarely feel anything while running. Normally, after a strong effort in a race, I would feel significant pain, even if it subsided in a few hours. After this new pr on Sunday, virtually no pain. Awesome. Second, I am thinking that my approach to running over these last few weeks has led me to simply run easier, and perhaps as a result of that, with less stress to my body. I have been practicing good running technique now for years, but something shifted with the goal of running for transportation. I can tell I am running with a completely different mind-set, and the payback is that my race form has likely improved. More on that later I am sure. Since I could tell I was recovering from Sunday, I decided to do an easy 3 mile arc around the Art Museum, but as I neared the museum I decided to take it even easier by running along the front instead of looping behind. 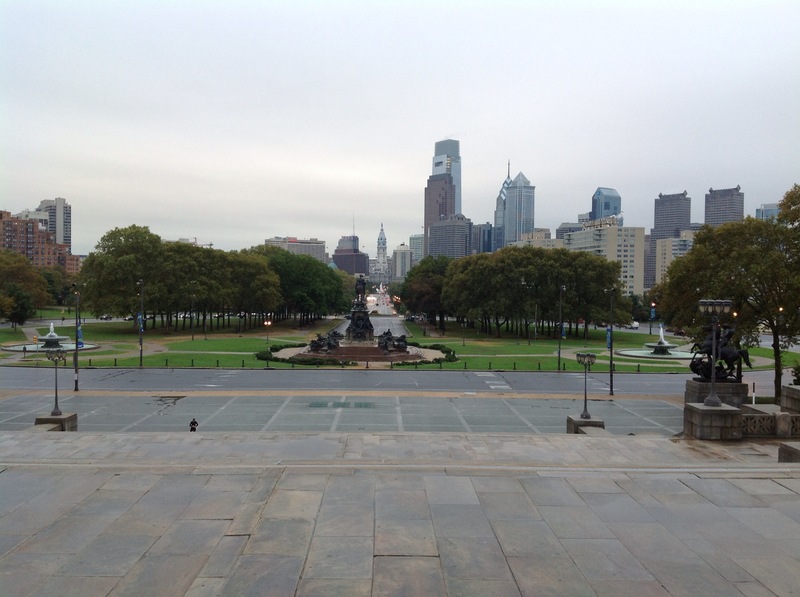 As I ran along the base of those iconic steps, it occurred to me that someone who happens upon this blog might not know anything about Philadelphia, or what a great city it is to run in. 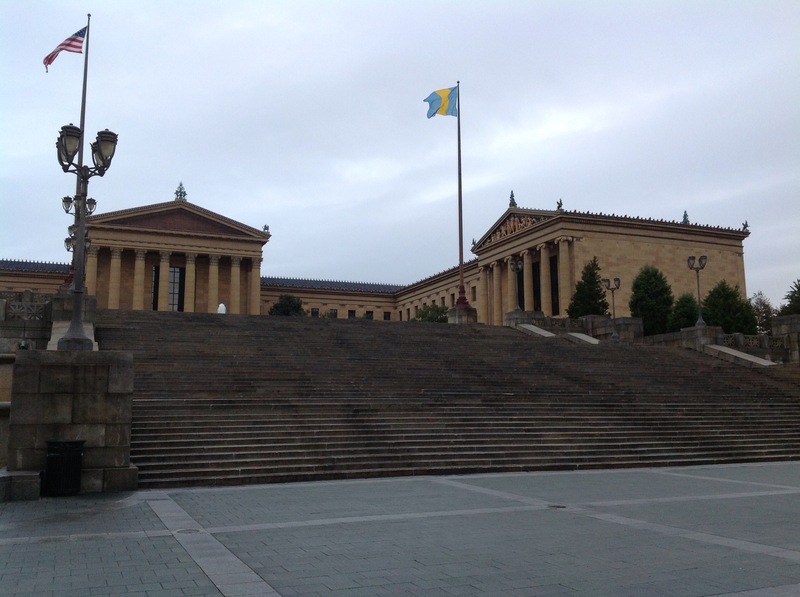 These are the steps made famous, to the chagrin of Philly’s highbrow elite, by Rocky Balboa. After running across the city, on his first attempt to run up the stairs, Rocky fails miserably. Later, we see him make it all the way to the top, triumphantly jumping up and down with arms stretched to the sky, celebrating a personal victory in the wee hours of the morning (in 1976 too early for another soul to be out there running with him). As a result of that movie moment, thousands of people from all over the world have made pilgrimages to these steps, to run up them too, and celebrate like fools at the top. It is the kind of thing that, being from Philadelphia, warms my heart every time I see it. This phenomenon was already in full swing for years before the controversial Rocky Statue was placed at the base of the steps. 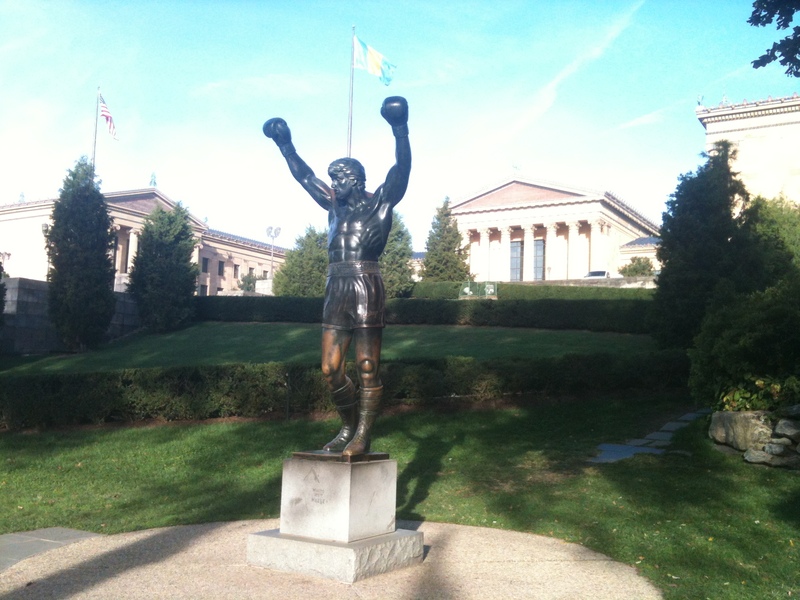 After the filming of Rocky II, the prop was placed at the Spectrum, where the big fight between Rocky and Apollo Creed was filmed. It was there for many years, and then ended up in storage. After years in storage, someone proposed moving it to the Art Museum, and those highbrow elites tried to block it, somewhat understandably. But eventually the gritty middle-class roots of the city won out, and Rocky found his permanent home at the museum. In my humble opinion, it makes this corner of the city just about the greatest tourist attraction on the planet. It is a perfect combination of giant scale beauty and prestige (the Museum) and kitschy, school-spirit, optimistic enthusiasm. Now it’s not just the steps that draw visitors from around the world, but the chance to snap a photo with Rocky after making the climb. Once I was heading home after a late night out and I saw a cab pull to the curb, where a small group of people clamored out, ran up to the statue and snapped that photo. I have also seen throngs of people waiting in line before big races like the Philly Marathon to get the same shot. It is truly a sight to behold — after weeks of training for the race, nervous, excited runners donning their marathon attire take their place below Rocky’s raised arms and imitate his pose with giant smiles stretched across their faces. Just warms my heart. And I get to run by places like this on my way to work.